Finding value in DFS can be the difference between winning serious money and coming away with nothing. Each week we’ll release our top DFS value plays to help fill out your lineups. In Week 10 we recommend riding Mitchell Trubisky versus the Lions and predict another big game from Duke Johnson. Finding value in DFS can be the difference between winning serious money and coming away with nothing. Each week we’ll release our top DFS value plays to help fill out your lineups. In Week 10 we recommend riding Mitchell Trubisky versus the Lions and predict another big game from Duke Johnson. ## Mitchell Trubisky, Bears ($5,600 DraftKings) ($7,700 FanDuel) Trubisky threw for only 135 yards with one touchdown and an interception last week versus the Bills but that's a throwaway game. The Bears' defense dominated Buffalo and scored twice. Trubisky didn't have to do much. Going back to his four prior games, Trubisky scored 46, 31, 36 and 22 DraftKings points. Expect Trubisky to return to form this week versus a Lions defense that's allowed multiple touchdown passes to a quarterback six times in eight games. Given his reasonable $5,600 salary on DraftKings, Trubisky is one of the top value plays at any position this week. 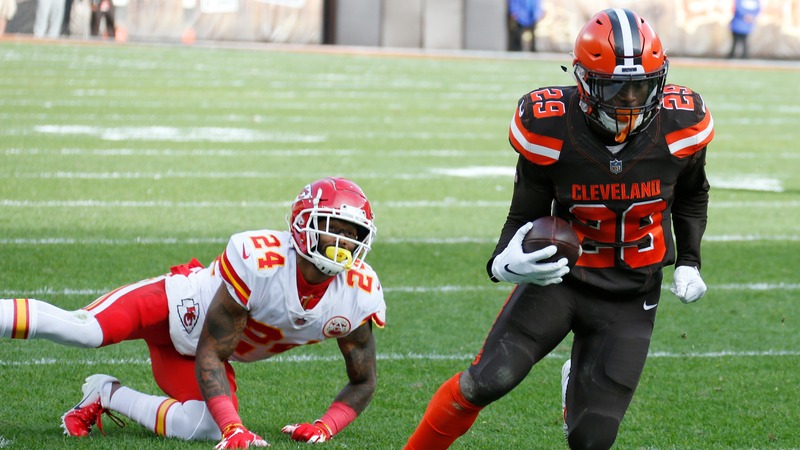 ## Duke Johnson, Browns ($4,700 DraftKings) ($5,600 FanDuel) All it took for Johnson to become a big part of the Browns' offense again was the firing of Hue Jackson and Todd Haley. Who knew? Well, pretty much everyone. Johnson was comically underused under the old regime. Before Sunday, Johnson - one of the best pass catching backs in the NFL - scored double-digit points in PPR leagues just twice in eight games. Johnson was finally freed against the Chiefs catching nine passes for 78 yards and two touchdowns. Granted, the Chiefs' defense gives up the most fantasy points per game to running backs and an average of seven receptions per game. Guess what? The Falcons are even worse allowing 8.5 receptions per game to running backs. Johnson is primed for his second straight big week. __More fantasy:__ Week 10 starts and sits ## Jordan Howard, Bears ($4,700 DraftKings) ($6,500 FanDuel) Howard doesn't have a great yards per carry average, although he's scored four touchdowns in the last three games. That average should go up on Sunday. The Lions allow an NFL-worst 136 yards per game on the ground. Detroit has already given up at least 72 yards rushing to a back six times this season with four players going over 100 yards. Howard has been a disappointment this year but he should pay off big for fantasy owners in Week 10. ## Josh Gordon, Patriots ($6,000 DraftKings) ($6,700 FanDuel) Gordon is starting to become a factor as a big-play receiver in the Patriots' offense. He's coming off his best game in New England with five receptions for 130 yards and a touchdown on 10 targets. The 10 targets are the most encouraging stat because it means Tom Brady trusts Gordon. He's been targeted at least seven times in three of the last four games. This week Gordon gets a chance to feast on a Titans secondary allowing the 12th most fantasy points to receivers. It's time to ride Gordon before his salary explodes. ## Austin Hooper, Falcons ($3,800 DraftKings) ($5,800 FanDuel) You have to pick your spots with Hooper. Hooper can take advantage of defenses that struggle to contain tight ends. In games against the Buccaneers and Steelers, Hooper put up 16.7 and 22.1 DK points. He has another one of those favorable matchups this week. The Browns are allowing the ninth most fantasy points to tight ends. Four different tight ends have recorded 60 yards or more against Cleveland. Hooper has predictably disappeared the last two weeks but look for him to re-emerge on Sunday. Saints at Panthers betting lines, odds, ATS pick: Can New Orleans keep paying out?